Innovative use of Deacero’s recycled steel products combines with bold native planting designs, attractive hardscape, and an innovative water reuse system to create a site that is attractive, sustainable, and expressive of company’s identity and products, while demonstrating SEMARNAT principles for protection of Mexico’s precious natural resources. 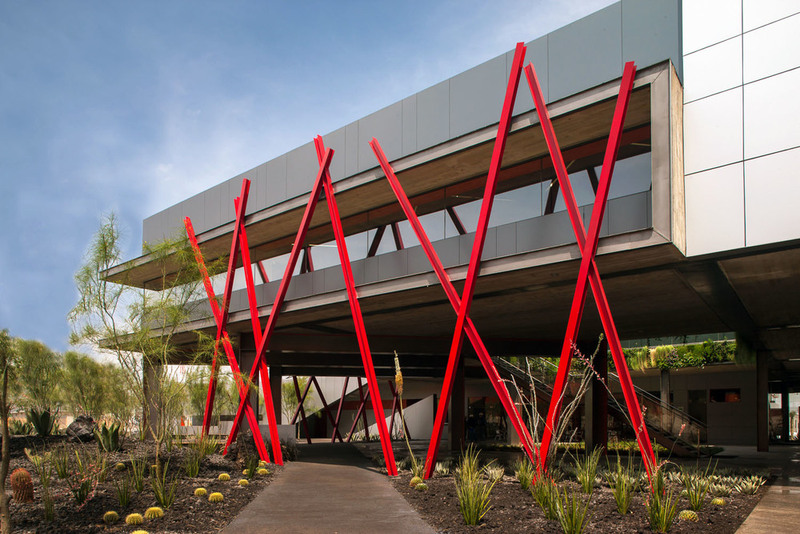 The Headquarters site features a diverse assemblage of native plants found in nearby Chihuahuan Desert plant communities, including a bosque of Palo Verde trees, which are irrigated with recycled wastewater. Use of recycled materials, such as slag groundcover, and Deacero products, such as custom wire gabion benches, are key defining elements of the site, while a minimalist water feature utilizes an I-beam to express the beauty of steel while offering a pleasant cooling effect for employees and visitors who take refuge in the courtyard. A series of constructed wetlands near the main entrance, the Cienegas, will infiltrate and and remediate both stormwater and process water from the manufacturing process, and colorful, wildlife permeable fence installations will adorn the site perimeter. The project was completed in 2013.